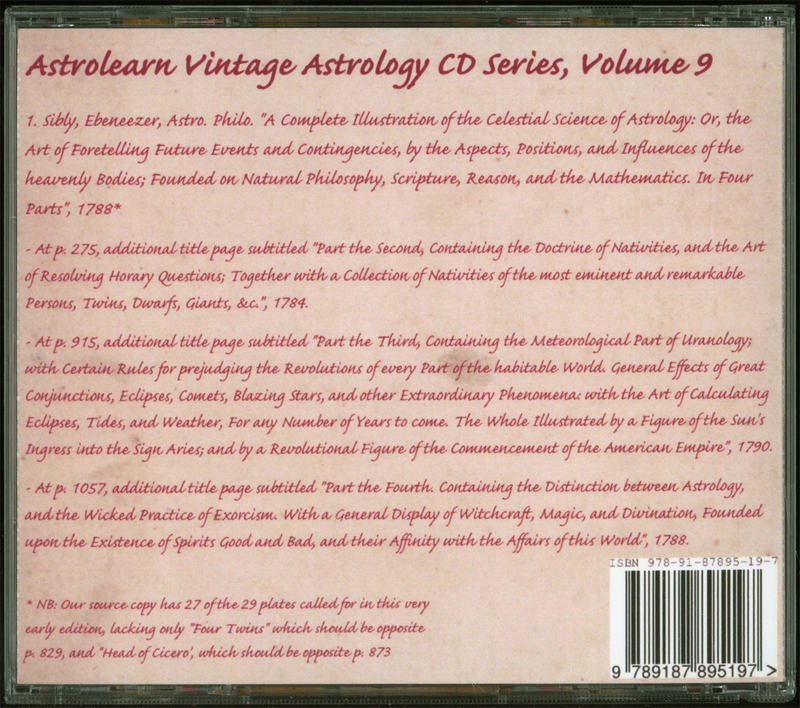 This particular CD contains the scan of one very large original antiquarian volumes from Astrolearn’s private collection, as detailed below. 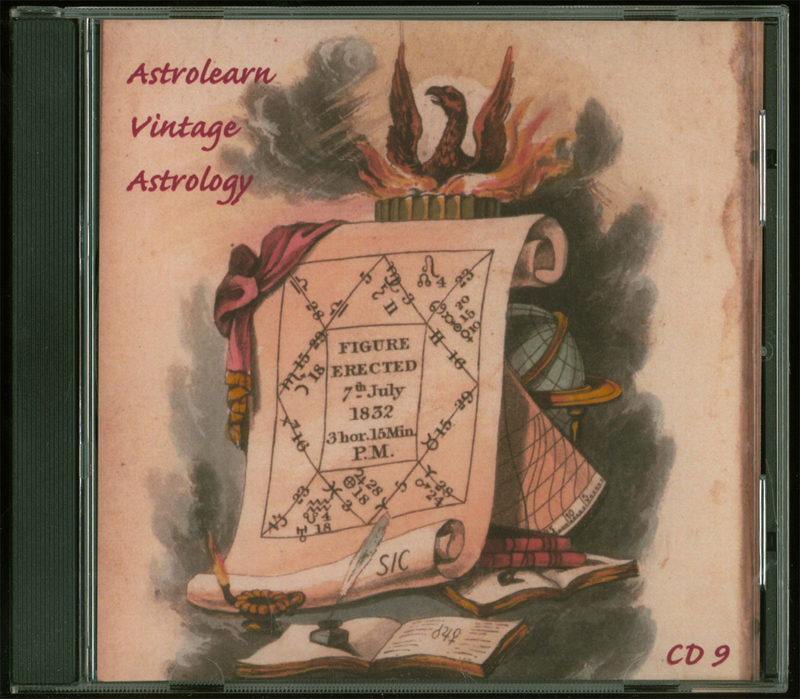 Sibly, Ebeneezer, Astro. Philo. 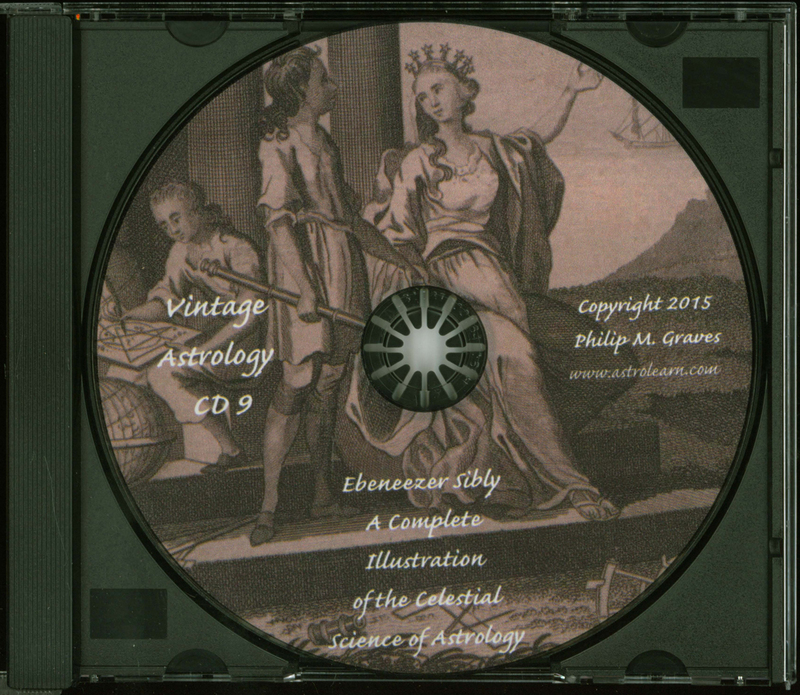 ‘A Complete Illustration of the Celestial Science of Astrology: Or, the Art of Foretelling Future Events and Contingencies, by the Aspects, Positions, and Influences of the heavenly Bodies; Founded on Natural Philosophy, Scripture, Reason, and the Mathematics. In Four Parts – Embellished with Curious Copper-Plates’ Printed for Green & Co., Mo. 176, Near Surry-Street, Strand, London, 1788 (overall title page). Cloth (library-rebound thus). (Lacks two of the called-for plates: ‘Four Twins’ which should be opposite p. 829, and ‘Head of Cicero’, which should be opposite p. 873.) [Frontis.] +  + viii + [pp. 13-28] + [pp. 39-70] + [Plate] + [pp. 71-106] + [plate] + [pp. 107-274] + [single-sided title leaf] + [pp. 277-390] + [plate] + [pp. 391-618] + [plate] + [pp. 619-756] + [folding table] + [pp. 757-792] + [plate] + [pp. 793-798] + [plate] + [pp. 799-844] + [plate] + [pp. 845-846] + [plate] + [pp. 847-852] + [plate] + [pp. 853-856] + [plate] + [857-866] + [plate] + [pp. 867-882] + [plate] + [pp. 883-888] + [plate] + [pp. 889 (1)-889 (2)] + [plate] + [pp. 891-892] + [plate] + [pp. 893-910] + [plate] + [pp. 911-914] + [single-sided title leaf] + [pp. 917-950] + [folding plate] + [pp. 951-964] + [plate] + [pp. 965-968] + [plate] + [pp. 969-987] + [pp. 989-991 (1)] + [pp. 991 (2) – 1038 (1)] + [pp. 1038 (2)-1041] + [pp. 1043-1052] + [plate] + [pp. 1053-1054] + [plate] + [pp. 1055-1056] + [single-sided title leaf] + [pp. 1059-1060] + [plate] + [pp. 1061-1098] + [plate] + [pp. 1099-1102] + [plate] + [pp. 1103-1106] + [plate] + [pp. 1107-1114] + [plate] + [pp. 1115-1126] + [p. 1125 (2)] + .